2017 Alfa-Romeo Giulia Pros and Cons: Why (Not) This Car? Anyone seeking an upscale compact sport sedan in 2017 faces a bewildering number of options. BMW still offers the 3 Series, of course, and both the Audi A4 and Mercedes-Benz C-Class also have been around for a while. Lexus and Infiniti joined the fray with the IS and G in the early 2000s. (The latter has been succeeded by the Q50.) Detroit finally offered a legit 3 Series competitor with the 2013 Cadillac ATS. Jaguar recently introduced the XE, bringing the class size to seven. To this crowd Alfa Romeo, an enthusiast-oriented marque with a glorious racing history, adds the Giulia. But who needs an eighth option to further complicate their decision? Can the Giulia possibly bring something new to the table that will more than offset the risks inherent in buying a car that's not only all-new, but Italian, and thus likely to be bedeviled by glitches? It better. FCA (Fiat Chrysler Automobiles) put most of its other brands on a new product diet so that it could wager more than $5 billion on rejuvenating Alfa Romeo. Initially CEO Sergio Marchionne set a goal of 500,000 annual global sales by 2014. This was later revised to 300,000 by 2016 then 400,000 by 2018. The most recent target includes 150,000 sales in North America, where Alfa last sold more than a handful of cars over two decades ago. A tall order. Luckily the Giulia won't have to fill this order all by itself. Other new Alfas are on the way, including the 2018 Stelvio compact crossover. They'll all share quite a bit with the Giulia, so the sedan should suggest the odds of FCA's bet paying off. Among the Giulia's competitors I most recently reviewed the Audi A4. Not the competitor most similar to the Giulia--that's probably the ATS--but, by doing nearly everything well, the Audi is the best all-around car in the class. As such, it provides a suitable yardstick against which to measure the extent of FCA's folly. Why the 2017 Alfa Romeo Giulia? What business does the combination of Fiat and Chrysler have developing a BMW competitor? Well, until recently FCA also owned Ferrari. When CEO Sergio Marchionne decided to place a big bet on Alfa, he tapped a senior Ferrari engineer to lead the development team. That engineer (now back at Ferrari) formed a small "skunk works" that focused on making the Giulia the best-driving car in its class. They succeeded. Only the Cadillac ATS arguably handles better. But the Giulia handles nearly as tightly and precisely, plus its steering has a delightful quickness I've never previously experienced in a sedan. The last car I drove with shockingly quick steering given its exterior dimensions was the Ferrari FF. The influence is real. I've driven four Giulias. Two were the Ti Sport variant, one rear-wheel-drive with the Performance Package and one all-wheel-drive without that package. A third, a Ti Lusso "luxury" variant with AWD, I had for a week. The fourth was the 505-horsepower Quadrifoglio (Italian for "four-leaf clover," often abbreviated QF). Sadly, I drove the last for a single lap on a wet track with a conservative overseer riding shotgun, so I learned virtually nothing. Then again, I enjoyed the Ti so much that I perceive little need for the pricey QF. Among the four-cylinder Giulias the rear-wheel-drive Ti Sport with the Performance Package is most fun to drive. This package includes adaptive dampers and a limited-slip rear differential. I detected little benefit to the former, but the latter makes it especially easy to adjust the attitude of the chassis with the accelerator. Both Ti Sports had a sport suspension and lower profile tires on 19-inch wheels that noticeably sharpen the steering and handling. But even the Lusso with its less grippy 18s was quite enjoyable. AWD also deadens the steering and handling a touch, but even with it an entertaining (and well short of frightening) amount of tail-out oversteer can be provoked. This highlights the primary problem with the Audi A4: while extremely competent, the German sedan's not nearly as engaging or as fun to drive as the Giulia. Unlike Alfa, when tuning its chassis and AWD systems Audi maximizes stability and predictability at the expense of entertainment. Secondhand impressions of the QF suggest all is not well when horsepower are dialed up to 505. In the Ti the stability control cannot be defeated. In my driving on public roads I never found it intrusive. In the QF the stability control not only can be defeated but must be if you want to hear the engine at full song; both are accomplished by switching to race mode. The problem then: others have found the QF overly eager to spin with the nanny off. The Giulia is so much about engaging dynamics that the Lusso "luxury" variant doesn't compute. The Giulia rides smoothly and quietly, but doesn't insulate the driver and passengers the way a luxury-oriented car should. It's just too much about the driver for that, and as far as I'm concerned all the better for it. Compare the Giulia Ti Sport to the similarly driver-oriented Cadillac and Jaguar, though, and it clearly has the most absorbant ride. Fit a Mercedes-Benz C-Class with its optional sport suspension, and it clomps loudly over bumps. The Alfa doesn't. The Giulia's development team is rightly proud of the combination of ride and handling it achieved. One Ti Sport was fitted with the optional adaptive dampers. I couldn't discern any effect on ride quality. 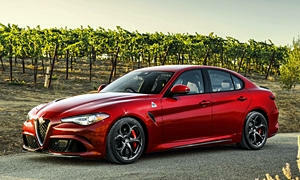 The 505-horsepower Giulia Quadrifoglio, its turbocharged 2.9-liter V6 engine essentially three-quarters of a Ferrari V8, has been receiving the bulk of media and enthusiast attention. In comparison, a turbocharged 2.0-liter four-cylinder engine with a single overhead cam sounds boring. But that single cam manipulates the lift as well as the timing of four valves per cylinder via Fiat's innovative MultiAir system, achieving 280 peak horsepower and 306 pound-feet of torque, excellent specs for an engine of this size. Those for the Audi: 252 and 273. But numbers can be understated. More important: how quickly a car accelerates and how powerful and responsive it feels. Well, the Giulia can get from a dead stop to 60 mph in just a bit over five seconds, virtually matching the best-in-class Audi. Subjectively, it feels even stronger and more responsive than the Audi, with boost lag evident only when starting off from a dead stop. There's rarely a need for quicker acceleration on public roads. My main issue with the four-cylinder engine: at idle it sounds more than a little like a diesel. In casual driving the engine's power delivery and the transmission's shifts can feel a little lumpy. In general, the closer the accelerator is to the floor the better this engine sounds and feels. Good fuel economy in a performance-oriented sedan? Sure, why not. The Alfa's throttle-less MultiAir engine intake system and an all-wheel-drive system that only engages the front wheels as needed help deliver highly competitive EPA ratings: 23 mpg city and 31 mpg highway. The Audi A4 scores only slightly better: 24/31. Opt for rear-wheel-drive and the Alfa rates 24/33. The BMW and Mercedes are also in the same ballpark. Other competitors are thirstier. In my regular suburban driving the trip computer in the Giulia Lusso with all-wheel-drive reported averages in the upper 20s. If I tried to maximize fuel economy the trip computer average topped 30, with a best of 35.7. On a 70-mph highway the trip computer reported averages from 31 to 35. All of these numbers are quite good for such a quick sedan fitted with AWD. I observed similar numbers in the Audi. Why Not the 2017 Alfa Romeo Giulia? Since the Giulia is all-new, we won't have reliability stats for it for a while. But, given Fiat's recent record and Alfa's history, people have been expecting the car to be troublesome. Those tested by various car magazines have been fulfilling these expectations. I don't normally give any weight to one or two stories of troublesome press cars. But this seems to go well beyond that. Hopefully Alfa gets the car's initial issues sorted out. The Fiat 500 became reasonably reliable in its third model year. The latest Audi A4 has been well-behaved in its first model year. While it could yet take a turn for the worse, recent Audis have tended to be about average or better for the first four-to-six years of ownership. As of July 2017 we do not yet have the Giulia included in TrueDelta's Car Reliability Survey because not enough have been signed up. I'd love to fix this. If you know someone with a Giulia, send them here to join. Unlike the Audi, BMW, and Cadillac, the Alfa Romeo Giulia can't be purchased with a manual transmission in North America. One would make an engaging car even more involving. For me, this might be an even more serious issue than the car's iffy reliability. As long as I'm imagining my dream Giulia, I'd like it to be a wagon or at least a hatchback. As is, Alfa offers the car only as a less interesting, less practical sedan and very likely intends the closely related Stelvio crossover for those seeking a fifth door. But the Stelvio's much taller, offered only with all-wheel-drive, and won't handle as well. Beyond transmissions and body styles, quite a few features are available on the Audi A4 (and other competitors) but not on the Giulia. These include an around-view camera system, head-up display, LED headlights, a telematics system, and automatic climate control for the rear seat vents. For a more complete list, see our price and features comparison. These features might or might not matter to you. Audi, BMW, and Mercedes all permit modes for steering, suspension, throttle, stability control, exhaust note, and so forth to be set separately. Alfa should do the same. As is, you get all systems set to sport, or none of them. Luckily the throttle and transmission aren't overly aggressive in sport mode. But if they could be adjusted separately they could be even more responsive when this is desirable, and less frenetic when it isn't without requiring that the steering, suspension, and so forth also be dialed back. Some people appreciate it when the driver seat automatically motors rearward every time the car is turned off. I don't. In fact, this feature annoys me. In every car I'd previously tested with this feature it could be turned off. Not in the Alfa. Aside from this lack of customization, the Giulia's controls and intruments work well enough. The infotainment controls, like those in the Germans, are based around a console-mounted knob. But the look and feel aren't nearly as slick or as upscale as those in the Audi. One final nit: I never got used to having the start button on the steering wheel, and on the lower left side on top of this. Unless you drive a Porsche 911, you're probably not used to starting a car with your left hand. Plus if you don't center the wheel when parking then the button ends up somewhere else. Starting a car shouldn't require a hunting expedition. The Giulia's rear seat is roomier than those in the the similarly driver-oriented Cadillac and Jaguar. But, firm and poorly shaped, it isn't comfortable. The roomier and much more comfortable rear seat in the Audi A4 easily wins this one. The Giulia appears stylish and sporty when fitted with the right wheels. But aside from its very Alfa face there's nothing distinctive about its appearance. From the side it could be mistaken for a BMW 3 Series. With the wrong wheels or from less flattering angles the sedan can appear a little pudgy. The Alfa Romeo Giulia's interior appearance is a mixed bag. Some of the plastics and controls appear not quite worthy of the car's price. But leather trim on the instrument panel and door panels, included on the QF and Ti Lusso and a $995 option on the Ti Sport but not offered on competitors, takes the ambiance up quite a few notches. I wouldn't get a Giulia without the full leather treatment. Wood trim, standard on the Ti, doesn't suit the character of the car. The lighter toned wood, a no-cost option on the Lusso, suits it even less. Why try to make this car look like something it isn't? I much prefer the aluminum trim included in the Sport Packages or the carbon fiber trim in the QF. Jump back and forth between the Giulia and a BMW 3 Series, and you might be surprised how much narrower the interior of the latter feels. In comparison, the front seat of the Alfa seems like that of a midsize car. But so does the front seat of an Audi A4. A caveat: relatively tall drivers often find that that the B-pillar blocks their vision to the side. The Giulia's doors seem somehow smaller than most others in the class, so relatively large people might find getting in and out a squeeze. Front seat comfort and support vary greatly by Giulia variant. The base seats feel overly firm and flat, and provide little in the way of lateral support. The Lusso front seats seem somewhat more comfortable and supportive. But many people will find the cushion too short and the side bolsters insufficient. The best front seats for the Giulia, by a wide margin, are the Ti Sport's. The side bolsters are not only larger, but they're adjustable. Plus the length of the cushion can be manually adjusted. I've only driven the Audi A4 with its standard seats. These are better than those in the base Giulia, but no match for those in the Ti Sport. The Alfa Romeo Giulia and Audi A4 both have prices that range from the high 30s to the low 50s. The Giulia costs about $2,000 less when both are loaded up, but the Audi more than compensates by including about $3,800 in features that are not available on the Alfa. Depending on which features are of value to you, either car could seem a slightly better value than the other, but they're in the same ballpark. Then again, most buyers of these cars don't actually buy them; they lease. Quite often a luxury car with a higher sticker price will have a cheaper lease. When I last checked Alfa's leases were not competitive, but if the cars don't sell this could change, and might have already. In recent years the BMW 3 Series (compared here to the Jaguar XE) and its competitors have become less fun to drive as they've been "improved." Especially given this, I was delighted by the Alfa Romeo Giulia. Its lively, engaging, and involving character highlights how much has been lost elsewhere in the pursuit of refinement (exemplified by the Audi A4) and broader appeal. I thoroughly enjoyed driving it. Yet the Alfa also rides better than competitors when those are fitted with handling-oriented suspensions. The only thing a North American driving enthusiast might miss: a manual transmission isn't offered here. Beyond its powertrain and chassis, the Alfa doesn't stand out in any area, but it doesn't lag, either. It's a very good all-around car. So why not buy one? There's only one strong reason (unless you want a manual transmission or don't want a sedan): initial reports suggest that many Giulias have been troublesome. By leasing rather than buying you can avoid a lengthy commitment, but this won't avoid the likely hassle of trips to the dealer. Hopefully Alfa will soon sort out the Giulia's initial glitches. If and when it does, I'll strongly recommend the car. Alfa Romeo and Audi each provided a car for a week with insurance and a tank of gas. Alfa also provided cars at a regional event. Michael Yamarino of Golling Alfa Romeo in Birmingham, MI, (248-502-0880) helpfully provided a third Giulia for a test drive. 2017 Alfa-Romeo Giulia pros and cons, according to Michael Karesh: the best reasons for buying (or not buying) the 2017 Alfa-Romeo Giulia. Join TrueDelta to post your own impressions. It would be nice if FCA offered a true manual transmission on the Giulia. They are available in Europe, and were certified for sale in the USA, but in the end Alfa decided not to bring them over. So FCA, can you at least tell us why the change of plan? I thought you'd be correct in saying the Giulia sedan would handle better than thr small cuv based Stelvio. So I looked up Motor Trend figure-8 times and they are almost identical....suprised I was. The Stelvio is ot that much larger but built on the Giulia platform and is more Mazda CX-3 in style and shape. I'd also prefer the car with a manual. Most likely their reason is the usual one: insufficient demand. See TrueDelta's information for all Alfa Romeo models.